Myth or Truth: Can Tanning Beds Cause Skin Cancer? You aren’t the first one to wonder: can tanning beds cause skin cancer? The potentially harmful effects of excessive exposure to the sun’s UV (ultraviolet) rays have long been attributed as a cause of skin cancer. With both men and women obsessing overachieving that deep golden tan, the risk of skin cancer is continually present and continually growing. Although board-certified dermatologists such as Front Range Dermatology Associates can perform procedures such as Mohs Surgery in Greeley which have been developed to help combat skin cancer, the danger and damage caused by melanoma or other cancers should be avoided at all costs. Many people fixated on tanning believe that indoor tanning protects them as they aren’t outside in the direct line of UV rays, but the truth is that indoor tanning beds are just as dangerous. Tanning beds, tanning booths, and even sunlamps still expose the skin to UV rays and can still damage the skin in several ways. Regardless of where they initiate, UV rays are a leading cause of skin cancer. Skin cancer is a disease caused by the uncontrollable growth of abnormal skin cells. These abnormal skin cells are most often caused by DNA damage from ultraviolet radiation. This damage can lead to mutations, defects or even tumors. According to the Centers for Disease Control and Prevention (CDC), skin cancer is the most common type of cancer in the United States with the majority of cases caused by overexposure to UV rays. There are three major types of skin cancer: squamous cell carcinomas, basal cell carcinomas, and melanomas. Basal cell and squamous cell are more common, but melanomas are by far the most serious. All types of skin cancer, if left untreated, can spread to other parts of the body. You can read more about skin cancer by clicking here and more about UV light by clicking here. According to the Melanoma Research Foundation, almost 90 percent of melanomas are believed to be caused by exposure to UV rays, whether from the sun or indoor tanning beds. The damage caused to skin cells by UV rays accumulates as time passes and increases the risk of skin conditions, wrinkles, and skin cancer. Studies have shown that even just one bad sunburn can increase the possibility of developing skin cancer or melanoma later. Tanning damages skin cells regardless of how quickly it happens or to what extent. Even a base tan can lead to skin cancer, simply from the compounded damage done to the cells. Extensive and continual research on the topic of sun tanning has shown the obvious danger from chasing a glowing, golden brown skin tone. A tan is how the skin responds when skin cells are damaged and the more a person tans, the greater the risk of getting skin cancer. Perhaps you have told someone that tanning beds cause skin cancer and they’ve sought to refute your argument by saying it’s safer than being out in the sun. Indoor tanning, especially when done in excess and on a regular basis, is no less dangerous than laying out in the direct sunlight. Research has also linked indoor tanning to long-term skin damage and skin cancers. As previously mentioned, a tan causes damage to the skin’s cells regardless of how it is achieved resulting in premature skin aging, including wrinkles, or cancer. 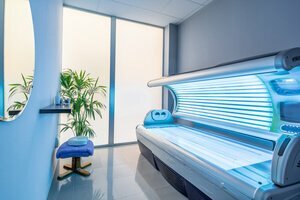 While the tanning industry claims that tanning beds are beneficial because of vitamin D, the truth is that tanning beds emit UVA radiation, rather than the UVB radiation needed to produce vitamin D. Excessive amounts of the most dangerous of UV rays will mutate the DNA in skin cells and run a high risk that they will lead to skin cancer. The World Health Organization’s International Agency for Research on Cancer (IARC) has identified tanning beds and tanning lamps in the category for the highest cancer risk. The dangers of indoor tanning, particularly in those under the age of 18, have been found to be so dangerous that many states have decided to ban the use of tanning beds by minors. Research has shown that people who use tanning beds before the age of 30 increase their risk of melanoma by 75 percent. Those with even the occasional sessions in tanning beds can triple the risk, and even just a single use can lead to an increased risk. People diagnosed with skin cancer can often be treated successfully. However, it’s far better to take preventative measures that will help you avoid needing treatment at all. The most effective way to protect yourself from skin cancer is to avoid tanning beds and excessive sun exposure, being mindful to apply a broad-spectrum sunscreen of SPF 30 or higher. Are you seeing changes in your skin or moles on your skin that are raising concern? Please, do not hesitate to contact us today.